Author(s): Douglass (Jane Dempsey) and Stotts (Jack L.). Subject(s): Presbyterian Church - Creeds, Reformed Church - Creeds, and Religion. 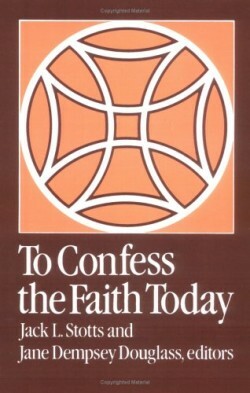 This book is an introduction to the deliberations of the special committee assigned to formulate a new Brief Statement of Faith for the newly reunited Presbyterian Church (U.S.A.), for possible inclusion in the Book of Confessions. Designed for clergy and lay people in congregations, the book makes an excellent resource for exploring the question of why and how the church can, should, and may confess its faith today, in a pluralistic world and in an ecumentical context. It also provides a basis for considering certain theological issues that emerged as significant for a contemporary confession.